"Well, here is the situation: although I have been around for almost as long as your creator, even after two thousand years of Christendom people get me wrong, misinterpret, and demonize me on a global scale . . . but nobody ever understood me. Actually, nobody even tries to understand me. Nobody comprehends my real role on this planet. That's why I want to reach out to mankind through you. Together we shall write a new book!" 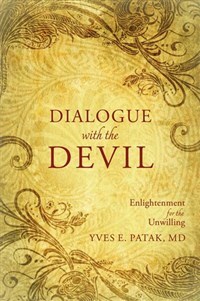 Dialogue with the Devil is a unique book. For many centuries, human beings have been fascinated by a so-called supernatural being called by many names: Satan, Lucifer, a fallen angel, and the Devil. Whether feared, worshipped, ignored, or discounted, there is no doubt that the devil has played a major role on the planet. But who is he? For the first time, he himself explains who he is, where he came from, and most important, what his “job” is on the earth and in the scheme of the universe. Challenging, controversial, and always fascinating, this book will shake the foundations of many a belief system and change the way we look at the Devil forever. Yves E. Patak, MD, works as a general practitioner, acupuncturist (ASA), and hypnotherapist in Zurich, Switzerland. Writing is his passion, and two of his novels have been published. During his medical studies, Yves spent three months in Jamaica, where he experienced uncanny phenomena that he partly incorporated into his first novel, The Healer, and his current project, The Screener. Numerous stays in the Far East, India, Sri Lanka, and the West Indies brought him into contact with diverse cultures, rites, tribal medicine, and superstition. All these experiences have strongly inspired Yves in his work as both a physician and a writer. My sincere thanks to Tiziana Della Tommasa and Hansruedi Ramsauer, who contributed essential ideas to this "otherworldly dialogue." Very fond thanks go to my trusted advisor and literary agent Karin Vial, who believed in this book, and last but not least to my publisher Bob Friedman. Without their help it would never have made it into your hands. From the practical point of view, my life was perfect. I was a successful and popular physician, born into a wealthy family. I had an attractive, intelligent wife and three charming children. Still, over the years a bitter suspicion had crept into my life, and eventually I came to the frustrating conclusion that I probably belonged to the species of the chronically discontented. While other people could not contain their enthusiasm about me and my life, all I could muster was a weary smile, while thinking to myself: "So--that's all, folks?" All my life I had been searching for ways to gain more--experience, success, enjoyment--and I had found them. But now I had reached a point where nothing could really stimulate me any longer. I had everything one could aspire to with reasonable ambition, everything one could achieve with hard work. Life somehow turned tepid and trite. So I lived my life with this dark cloud above my head--up to that unforgettable day, which would dramatically change my life forever. IT'S MY TURN TO SPEAK! My back broke into gooseflesh that spread over my arms until all the hair stood erect. My legs turned to jelly. A strange atmosphere permeated the room, like some foreboding presence. With a queasy feeling I sat down at my word processor and stared at these words. Who the devil would write such a thing? And how? The sense of imminent disaster turned into a haunting premonition when I realized that nobody was pulling off a stupid joke via the World Wide Web--but that someone had been sitting at my laptop! But when? While I was making the rounds through the seven rooms of my practice? I probably hadn't left my consultation room for more than three minutes. Feverishly, I tried to imagine the absurd scenario of a lightning fast burglar with a twisted sense of humor dashing to my computer just to leave me a note--an ominous line that didn't mean much more to me than the Heisenberg uncertainty principle or a Japanese instruction leaflet. I looked around. Everything seemed to be in its place. No signs of burglary, no evidence of vandalism, no stolen drugs or prescription pads. A spell of superstition made me pull out the wireless card that connected my laptop to the internet. I wanted to be 200 percent certain that no hacker could have caused this inexplicable situation, some wacky PC pro who from a distance was taking me for a ride. Then I pushed the power-down button once more. I waited for the screen to turn dark. That's when things really became spooky. The screen had turned dark all right, but the computer kept humming--and suddenly those eerie words--IT'S MY TURN TO SPEAK!--were written in red letters on a black background. My apprehension turned to terror. What the hell had gotten into my computer? Bewildered, I stared at the blood-red line that seemed to float above the dark screen. As a psychologically trained physician, I knew at once that the best explanation for this uncanny occurrence was that I had just lost my mind. I tried to imagine a life where I'd have to swallow a red pill in the morning, a green one for lunch, and a yellow one at night just to keep from hearing voices or seeing alien texts on my computer screen. YOU'RE NOT PARANOID. I JUST WANT TO CHAT WITH YOU FOR A WHILE. BUT IF YOU'RE NOT WILLING--THERE ARE MORE THAN ENOUGH SOULS WHO'D LOVE TO HEAR FROM ME.